Fleur de Louis (June, 1660: "Louis XIV’s first meeting with his young Spanish bride under a newly assembled pavilion of pine and cedarwood on the French-Spanish border") ~ a woody floral with orange blossom, orris and white cedarwood. Infanta En Flor (June, 1660: "designed to symbolize Maria Teresa, the Infanta of Spain, who was offered to Louis XIV in exchange for peace") ~ a floral musky amber with orange blossom, leather, citrus and immortelle. Anima Dulcis (November, 1965 [sic]: "interprets the interior of the Royal Convent of Jesus Maria, in Mexico City, where nuns once prepared spiced chocolate with a mysterious blend of chilies and spices") ~ a gourmand. Flor Y Canto (August, 1400: "celebrates the feeling and smells of an Aztec festival") ~ a white floral with tuberose, magnolia, plumeria and marigold. L’Etrog (October, 1175: "set in Calabria, Italy and inspired by the festival of Sukkot") — a citrus chypre with citron, palm leaves, willow branches, myrtle and dates. Aleksandr (January, 1837: "inspired by a frigid winter afternoon in St. Petersburg, Russia") — with neroli, fir balsam, Russian leather and ambrette. 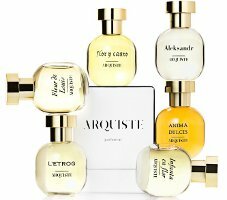 The Arquiste line will be exclusive to Barneys, and will be available in 50 ml ($165-175). I immediately thought of the HDP line or Romea de’Ameor collection. I know we can’t reinvent the wheel but really, these are so very similar… Not that I don’t want to smell each one, particularly the Anima Dulcis, Infanta en Flor and Aleksandr. Yes. Been there, done that. I will smell them if I see them, but if anybody thought this was an exciting new idea for a niche perfume line, they haven’t been paying attention to the niche perfume world. Maybe I’m just suffering from late-summer laziness, but… these feel like homework to me. “…the feeling and smells of an Aztec festival” is a white floral?! Where’s the scent of heart blood, fear sweat, Copal incense and the smell of the food vendors selling spiced chocolate drinks to the crowd while the priests throw another sacrifice victim down the pyramid steps? There *is* something about incense in the WWD description, but I could not quote the whole thing and it wasn’t repeated in the “notes”. Lol! Thanks, Robin. I was just “snarking off”. It does make it somewhat better, I guess. My p.o.v. is, if you’re going to get a thematic about it, why not actually try to use actual ingredients from the place or time you’re trying to invoke. Just sayin’. That’s exactly what I was going to say…. If they are so hellbent on romanticizing the Aztecs then have some guts to really do it. Where did they find the tuberose? Sounds so dumb & desperate for an angle. I thought the names would be different eras of history – “Dark Ages” “Age of Reason” “Romance” “Revolution” – that sort of thing. Alexsandr sounds interesting, but these probably won’t be readily available for a sniff – though I will if i get the chance. L’Etrog just sounds…schizophrenic? Italian version of Jewish festival? Huh? Too much homework for this teacher! See! With wikipedia, there *is* no homework. lol! So more to some of these frags than immediately meets the eye – uh, I mean nose! Fascinating (and so is the linked page on etrogs) – thanks, Faylene! thanks for the link. L’etrog is the one that actually intrigued me the most as a chypre fan. Jews in Italy – absolutely, part of the Sephardic diaspora. What’s with the snarky comments on historical inspiration? Why not? These sound much more interesting than other pseudohistorical fragrances. Too bad they are only at Barneys, which I’m nowhere near. Me either. And you’re welcome, Nozknoz. I absolutely love the Internet, and especially Wikipedia – I’ve always been excessively curious but hated doing traditional library research – and 3×5 cards! Unfortunately the key word here is “interpretation” rather than recreation…they smell like the same tired old ideas of what it was like back then masquerading under the guise of modern perfumery. very disappointing….and over priced.